On the troop ship SS Orbita returning home from Africa in the late 1940’s, Eric Hazeldine a Captain in the Royal Engineers with his wife Ruth designed the concept of the Hazelcar. With his brother Roy a Tank Officer with the Royal Gloucester Hussars, they set up a garage business in Telscombe Cliffs and Rottingdean in Sussex, here they built the Hazelcar. The initial idea was to make a scaled down version of a bigger car, one that had hydraulic brakes and a water cooled engine. It would be capable of 50mph and achieve 50mpg. A few different body styles were used, culminating with the pleasant roadster style body. A variety of engines were tried including Indian motorcycle, ( to underpowered ). The ford 8 four cylinder engine 933cc was successful, and then the Korean War broke out in 1950 and the supply of engines diminished. The Coventry Climax engine from the mobile fire pumps were tried but were unsuccessful. They then joined forces with the Battery Manufacturing Association (BMA) of Hove, Sussex, with whom they produced an electric version which included some vans of which pictures can be viewed under - Other Cars - on this website. John Sherwin who joined the staff as a fitter and was assigned to working on the Hazelcar at the Telscombe Cliffs garage. A clever and well thought-out idea the brothers had, was to place the Ford 8 four cylinder side valve engine with end on gear box, transversely in front of the rear axle (a rear mid engine). The heavier mass of engine in this position makes it easier for the suspension to absorb the force of the bumps and so creates a smoother ride, and also gives the car better grip for acceleration. With its little wheels which are fitted with 400 x 8 tyres it gives a surprisingly smooth ride. Lockheed hydraulic brakes from the Morris Minor MM series were used. They fitted the twin leading brakes to the rear to cater for the extra weight, and the handbrake works off the front wheels. Our vehicle LCD 778 a Ford 8 four cylinder petrol version was built in 1951 and was first owned by Sir Roderick Jones KBE of Rottingdean, who purchased the car for his son Dominick. Dominick used the car for six years and did regular trips between Rottingdean and London. He kept a detailed log of his journeys and maintenance of the vehicle. 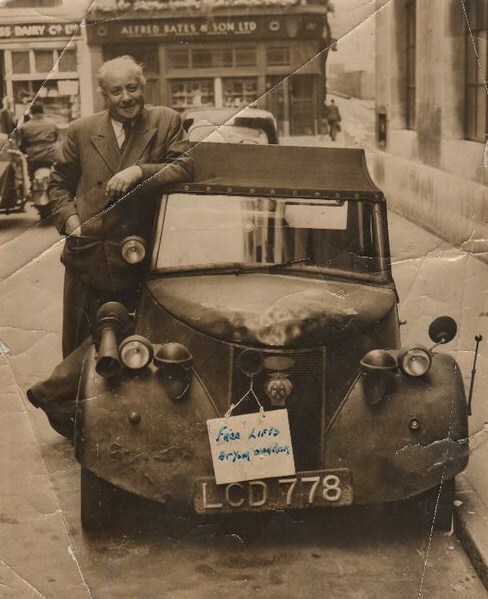 We know from his notes that he clocked up over 28,000mls in two yrs up to 1953 then adds, the speedo broke, he continued using the car up until 1957, so no doubt he clocked up well over 50,000mls and probably as much as 80,000mls. My grandfather Archie Hazell bought this car from Dominick as a non-running wreck in 1957. This car is currently in the Bentley Wildfowl & Motor Museum in Sussex. My Father Arthur Hazell restored our car completely on his own and gathered all the history and information over the years to build this website. Eric and Roy entered their car KUF 959 in various trials including the Daily Express 1000 mile Reliability Rally in November 1950, leaving London for Scotland then to Torquay. The Hazelcar was described at the time of its unveiling as a minor sensation. Exactly how many vehicles were made is not known, although a figure of 25 has been mentioned. We have evidence that 4 petrol cars were made between 1950 and 1951, however the exact number manufactured is unknown. The first prototype with slightly different body style can also be viewed under - Other Cars - on this site with the Hazeldines KUF 959, the four seater car LCD 597 and LCD 778. The Hazeldine brothers made two earlier prototype microcars: FNJ 81 and JUF 976. At least two electric vehicles in the early 1950s went overseas, one to Ceylon, one to Denmark. The electric Hazelcar is classed as a microcar, but the Ford 8 petrol version with its 933cc engine is not. We know of two Hazelvans made which were sold to the local Forfars bakery. How many others were made, is not known. BMA made their own electric van but the Hazeldines weren't involved in this project. With its small sized body and a little wheel in each corner, a four cylinder transverse engine, (they were probably the first to use a four cylinder transverse engine). The speedometer fitted in the centre of the dash (in all models except LCD 778), the starter mechanism on the floor and the Hazeldine's original car (KUF 959) had slide along door windows. All these ideas 10 years before the BMC mini. BMC in the mid 1950s were experimenting with a transverse engine with an end on gearbox to fit into the rear of a little car, but all this had been done years before by the Hazeldine brothers. 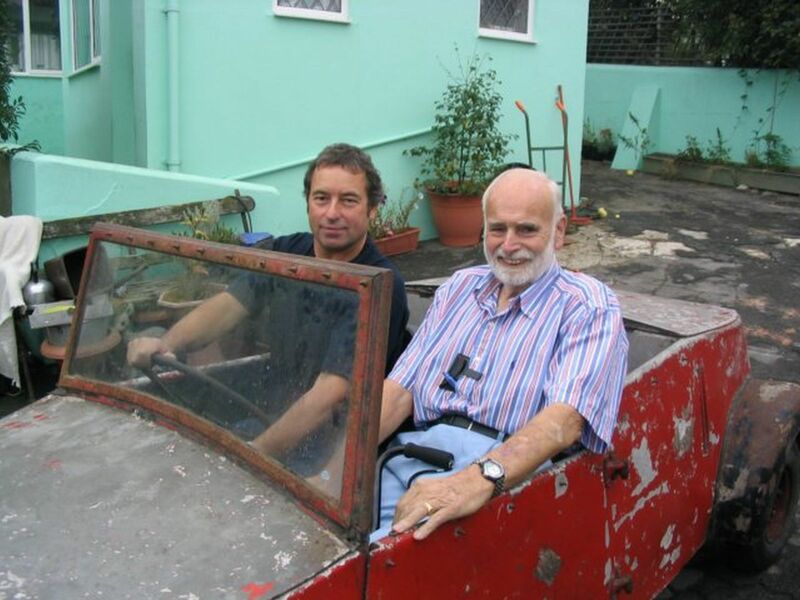 In 2001 a local journalist Tony Payne wrote an article about the Hazelcar. We put the article along with a picture in a local shop window in Saltdean, Sussex. Eric and Ruth Hazeldine emigrated to Canada in 1952. A young lady from Saltdean, Jo Vermeer was studying at University in America. Her flat mate asked her where she came from, she said Saltdean. Her flat mate said my Grandad came form near there, and he used to build little cars. When Jo Vermeer returned to Saltdean she saw the article, from that we made contact with the Hazeldines and have managed to gather all the history and newspaper cuttings from the early 1950's. See Jon Pressnells 4 page feature of the Hazelcar in - Classic & Sports Car - magazine, February edition 2008 and also Douglas d'Enno's Article which is now under - News Articles section - on this site. If you have any information or own a Hazelcar, please get in contact with us info@hazelcar.co.uk.